(Укр) Новий рік 2019 у колі друзів ! - Sorry, this entry is only available in Ukrainian. Salad with Korean-style carrot, Salad with herring, Mixed salad. Soup of the day, Broth with noodles. Turkey liver with buckwheat, Pancakes with stewed cabbage and mushrooms, Potato pancakes stuffed with meat. Restaurant complex “Gutsulska Grazhda” has been found in 2004 and since then it has proven itself to be a lovely place with excellent cuisine. Home grown products alongside with modernized techniques in cooking that we use, contribute to new gastronomic tastes. That’s how familiar childhood memories are revived in a brand new way. 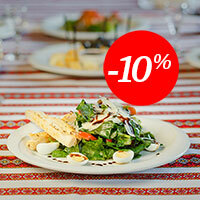 The restaurant is located in the city center, between two picturesque lakes and flower oases. And it’s always cozy here at any time of the year. Once visited “Gutsulska Grazhda”, you’ll always want to come back again and again. Big hall with children’s area for up to 100 guests, stylish “Hunter’s hall” with a fireplace for up to 40 guests, hall at the second floor for up to 30 guests. It hides from the stranger’s eyes behind the smoke from the smokery and flavor of fried meat; can get up to 30 guests. Korchma lies a beginning to ethnic and restaurant complex “Hutsulska Hrazhda”.